Have you ever read a story about someone’s car getting carjacked and thinking how that would never happen to you, because you’re such a badass you’d hang on to that car until the carjackers gave up? Well this woman from Milwaukee is the sort of badass in the real world that you are in your head. 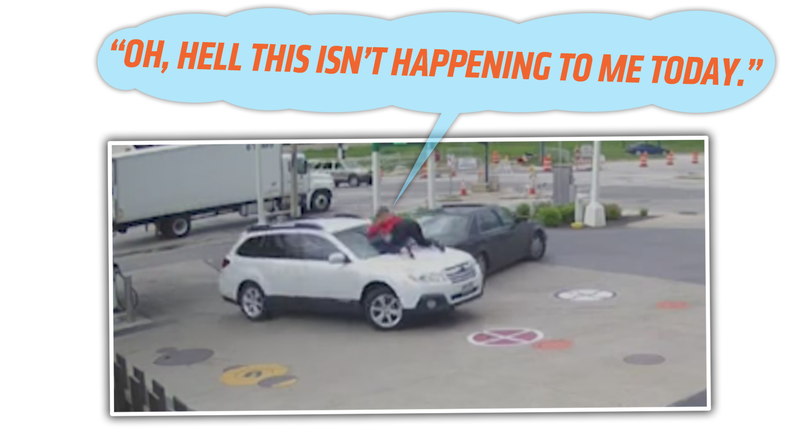 Melissa Smith is from Wauwatosa, Wisconsin, and she must really love her Subaru Outback, because when a carjacker sneakily entered her car and attempted to drive off, Smith jumped on the hood and didn’t get off until the carjacker gave up and bolted. The failed carjacking happened as Smith was buying gas. A Cadillac pulled up alongside the Subaru, and the carjacker snuck out, crouching between the cars until he made it to the Subaru’s door. The carjacker saw Smith on the hood and laughed at her, attempting to knock her off by braking hard. Laughs on him, though, as he had to bolt away like a dipshit, and Smith still has her car. Smith freely admits her actions weren’t exactly the safest or smartest, but she has her Subaru, and some dipshits don’t. I’d call that a victory.